John Atkinson, an area farmer and land owner, stands on a dike along the LaPlanche River near Amherst, N.S. on March 20, 2019. 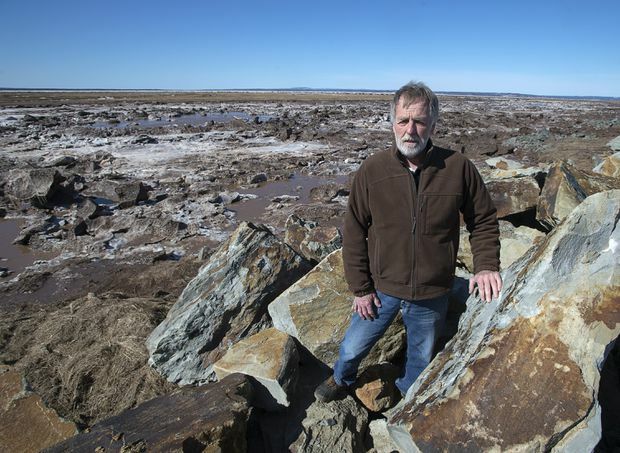 A plan to rehabilitate close to a quarter of Nova Scotia’s aging dikes threatened by rising sea levels was outlined Wednesday at a national historic site where Acadians first reclaimed the lowlands along the Bay of Fundy centuries ago. The province and Ottawa will share $114 million in costs of improving over 64 kilometres of dikes and their aboiteau – sluices under the dikes that allow water out at low tide and close when the tide is coming in. Bernadette Jordan, the federal minister of rural economic development, says the projects will help prevent the flooding of wineries, historical and world heritage sites, Indigenous communities and over 20,000 hectares of farmland over the next decade. “Rising sea levels and coastal flooding have the potential to create catastrophic consequences,” said Jordan during a news conference in Grand Pre, N.S. A study by a team of geographers at Saint Mary’s University has indicated that about 70 per cent of the 241 kilometres of dikes in the province could be overtopped in a severe tidal surge coming up the Bay of Fundy. The risks rise as climate change and a subsiding coast increases the chances of tides overwhelming existing protection systems. The province, which will oversee the work, expects to consult with Indigenous groups, Acadians and communities as they proceed with various potential solutions. Those may include giving up some of the thousands of hectares of lowland to the sea in areas where the foreshore of the dikes has gone through severe erosion. Kevin Bekkers – the official at the Agriculture Department overseeing the work – refers to the various approaches as a “tool box” approach to dike rehabilitation, differing sharply from the simple raising of dikes as occurred in the 1950s and 1960s during Ottawa’s last major investment. However, the province is already facing some criticisms for its proposals, such as the plan announced Wednesday to upgrade and raise a causeway next to Windsor, N.S., as part of a Highway 101 twinning project. Sonja Wood, chair of the Friends of the Avon River, argues it would be wiser to have opened the causeway blocking the flow of the Avon River, allowing wild Atlantic salmon and other species including eel to resume traditional migration patterns. She also says the plan to build three massive aboiteau through the proposed causeway may have been comparable in cost to reconstructing dikes along the Avon River – creating long term protection of the town as sea levels rise and inland rainfall increases. Wood says the town of Windsor may still risk inland flooding under the existing system if a dam further upstream were to prove inadequate. Bekkers says each project will involve study and there will be a “phased approach” to fixing the province’s dikes during the first 10 years of work. He said the province will continue gathering information on the remaining 177 kilometres of dikes. He adds that eight kilometres of that is slated for an upgrade as part of a project to protect the Chignecto Isthmus that will soon be reviewed for potential solutions. Requests to extend or lengthen dikes to protect existing structures will have to be considered against the costs, said Bekkers. “If there’s an existing dike in place, we’re trying not to expand the length of that … If we start looking at solutions like that they will be expensive solutions,” he said. The funds for improving the dike system had already been booked in the province’s capital budget, with the first rehabilitation project beginning this year near Nappan, N.S. A recent federal report on climate change projected that as the coast continues to subside and oceans warm, Atlantic Canadian coasts could see up to a metre of sea level rise over the next century. When combined with powerful storms and tidal surges, scientists are warning that dikes last upgraded over a half century ago won’t suffice to protect existing roads, homes and farms.